Whether for sophisticated thrusters or naval weaponry, or equipment such as compressors, winches or pumps, large specialty motors are used throughout the marine industry. So when one of these motors fails at sea, the ramifications can range from minor annoyance to complete shutdown, which can prove costly in time and money. This was the scenario that Sealion Shipping Ltd. faced when its aft starboard azimuth thruster failed in the waters off Mexico, rendering the vessel’s dynamic positioning (DP) system inoperable. As a provider of onshore, offshore and subsea support to the oil and gas industry, each support vessel in the fleet uses DP to carry a diverse range of equipment, cargoes and personnel to offshore drilling rigs and platforms. DP requires the use of the azimuth thrusters along with sophisticated GPS reference and other sensors. So when the aft starboard motor failed, the support vessel could no longer operate in DP. This threatened to take the vessel offline, potentially at significant loss of revenue, and would require an expensive and lengthy repair before the ship was fully operational again. For Sealion Shipping, the first priority was to keep the ship in operation – and earning revenue – until the motor was repaired. As an interim measure, a tug was employed at some cost to help maintain the vessel’s position. Sealion Shipping then contacted the motor manufacturer and was told it would have to be removed and sent to a central repair facility in Europe, with an estimated ‘out of service’ timeframe from four to five months. During the search for a solution, Sealion contacted the Louis Allis Company, which for more than 110 years has manufactured and repaired this type of motor. Founded in 1901 as a DC motor manufacturing firm by Milwaukee businessman Louis Allis, the company soon shifted to AC motors. Facing stiff competition from early motor giants such as GE and Westinghouse, the company decided to focus on specialty motors instead of mass-produced offerings. Today, Louis Allis manufactures specialty motors up to 20,000 hp, along with standard NEMA motors, in-stock recertified units, and motor repair services. Fortunately for Sealion, Louis Allis had a 3,500 hp motor in its inventory that could be delivered within the 10 days it would take the vessel to return to port. Although the main propulsion motors were two-speed, the replacement was single-speed. Fortunately, it was adequate for the DP and the ship’s maneuvering capabilities. 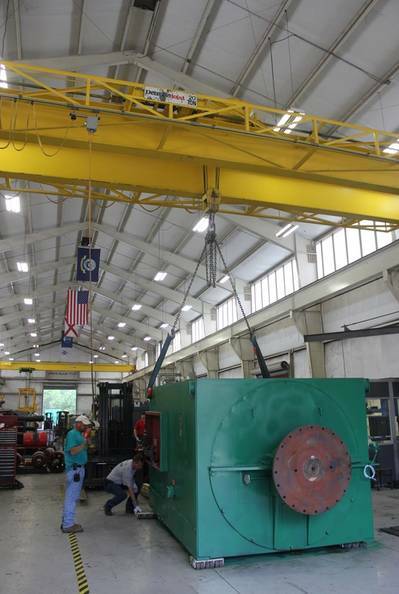 To facilitate speed of delivery, Louis Allis stocks used and surplus specialty motors it has purchased and refurbished. This includes taking the motor completely apart, cleaning it, replacing the bearings, varnish coating the windings, rebalancing, reassembling and conducting sophisticated testing. These units are ready for delivery at a moment’s notice. Before it could be shipped and put into use, however, the motor required a number of modifications. The motor was air-cooled, an issue that would increase the temperature within the engine room. Sealion Shipping preferred a water-cooled unit, but that was not possible within the time requirement. The temperature problem was manageable, however, and plans were made to convert to water cooling at a future date. Perhaps the most difficult modifications involved converting the standard NEMA (American) motor to fit the metric specifications and footprint of the motor being replaced. Sealion Shipping did not have construction drawings of the motor on hand, so instead videotaped a series of measurements of various aspects of the motor, as well as the mounting details. With this information, Louis Allis custom remanufactured the motor so it could be a drop-in replacement. This included ensuring that it would physically fit through a hole cut into the deck of the ship. The replacement motor was shipped by Louis Allis and arrived within the 10 days. “They managed to locate a suitable replacement motor very quickly, within a few days,” says Sealion Shipping’s spokesperson. In addition, Sealion tapped Louis Allis to repair the failed motor. Once the repairs were complete, the installation would occur during future scheduled maintenance or dry dock.